Join Leadership Paducah Class 32, presenting sponsor REGIONS BANK and Maiden Alley Cinema as we raise funds for Habitat for Humanity. 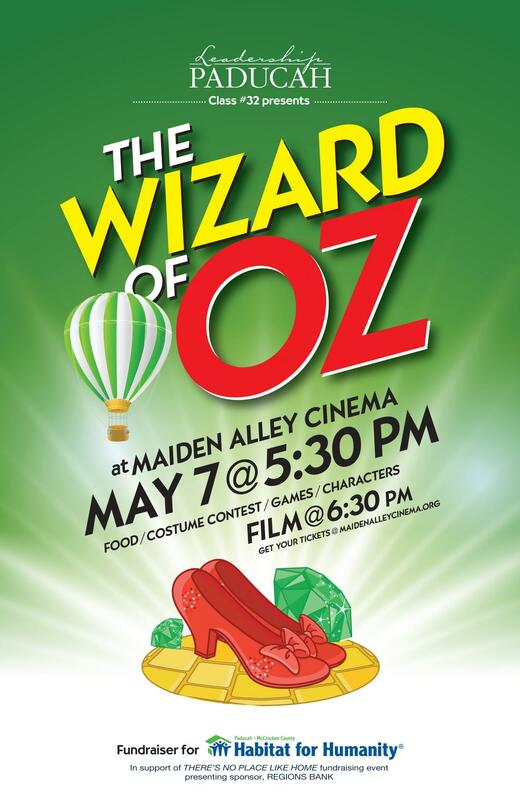 There's No Place Like Home and we want to celebrate that with a family friendly event including games, costume contests, a photo booth and a screening of The Wizard of Oz (80th anniversary) on the big screen. 5:30pm - Check in and grab some Wizard of Oz themed snacks. Sign up for costume contest if you wish to participate. Enjoy games, photo booth and lollipop raffle. 6:15pm - Head into the cinema and hear a brief (VERY BRIEF) overview of Leadership Paducah Class 32 and their project. 6:30pm - Start WIZARD OF OZ on the BIG screen. Activities will continue in the lobby during the film if people want to come and and go, grab another drink or mingle with other patrons.